What a great play on words – it describes the puzzle and the aim, perfectly concise. The next day Louis and I spent a while in a pub describing it to Nigel who’d just arrived from the UK – and I still have my drawing of the puzzle on the back of a beermat where we tried to tell Nigel what we’d tried in the hope of him pointing out something obvious that we’d missed … he didn’t. Flash forward a few more months and I’m chatting to Wil on a bus on the way to one of the IPP32 tours and he mentions that Gary Foshee has made a small run of Open Locks and he may have some for sale – immediate response “Yes please!”, and a little while later “How much, by the way?”. A few weeks after that one of Wil’s newsletters did the rounds and he’d included the Open Lock in there … and from Wil’s account, they were all gone in a matter of minutes! Having had so much challenge and fun from other people’s copies of this puzzle, I had to add it to my collection as well, so I was really happy to have been one of the folks who managed to secure one from Wil. You start out with a skeleton of a lock and a T-bar hex wrench. 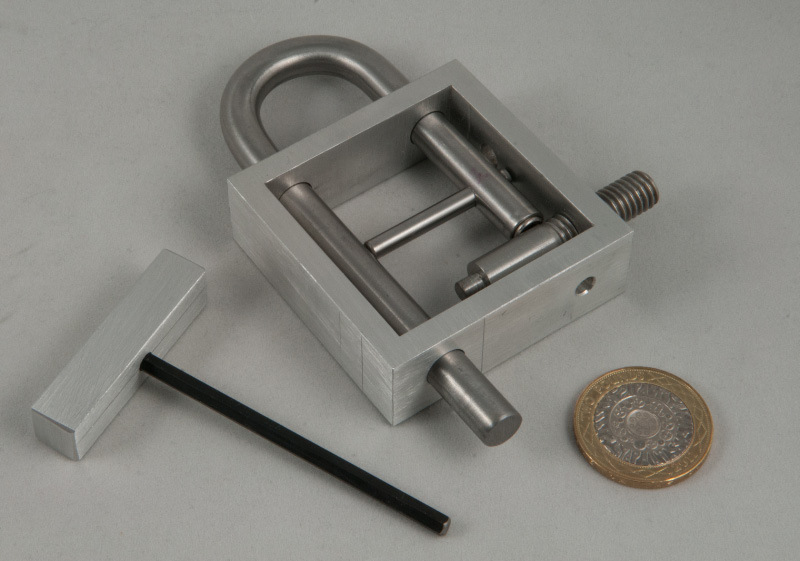 The lock consists of a square aluminium frame with a shackle where you’d expect it and a couple of interfering bars on “the inside”. The thicker interference is threaded and can be screwed in and out of the frame, a bit, but not enough… the thinner interference lines up neatly with a hole in the side and stops the shackle from pulling out… closer inspection shows that the shorter end of the shackle has a hex bolt embedded in it, but the geometry of the frame and in particular the lower bar, stop you from being able to use that handy hex wrench you’ve been given… which is a pity. From there the puzzle takes you on a little voyage of discovery providing tools and little discoveries along the way … and I really enjoyed at one point thinking to myself “Gosh, I wish I had a ….” only to discover one rather neatly hidden a step or two later. Open Lock is a really excellent puzzle that hides some wonderful little discoveries in what appears at the beginning to be a very simple, honest-looking puzzle. I for one am very pleased that Gary decided to make another short run of these puzzles and that I managed to snaffle one from Wil before they were all spoken for. Me too... What a pity. 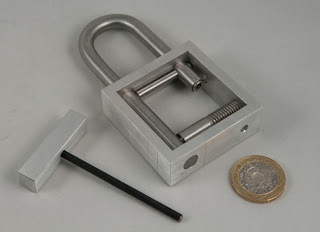 Brought another of his design - the Lunatic Lock a few months ago from Puzzle Master and throughly enjoyed it. Hope Gary would have more of these coming.